Slice the potatoes and onion. Arrange the potatoes in a spokelike pattern on the bottom of a large, 10- to 12-inch cast iron skillet. Once the bottom of the skillet is covered, add half of the onion and garlic. Use any remaining potatoes to create a second layer, and finish it off with the remaining onion and garlic. Drizzle with 1/2 tablespoon of olive oil. Now, prep the chicken. Using sharp kitchen shears, cut alongside the chicken’s spine. 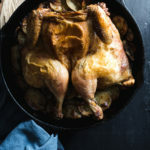 You can either cut the spine out completely or only cut one side and leave it attached (but don’t waste it – the tail is one of the best parts of a roast chicken!). Force the chicken open, and use the shears to snip the cartilage on the breastbone. Flip the bird over (skin side up), and you should now be able to press the bird relatively flat. Move the chicken to the skillet and lay it directly on top of the potatoes and onions. Drizzle with a tablespoon of olive oil and sprinkle with sea salt. Use your fingers to rub it in and cover every inch of skin. Bonus points if you gently work some of the salt/olive oil under the skin, too! Transfer to the oven and roast at 425 degrees for 45 minutes to an hour. The chicken is done when the internal temperature reads 165 degrees F. If the skin doesn’t look super crispy, turn the broiler on and broil for 2-3 minutes to finish crisping up the skin. Remove the skillet from the oven. Transfer the chicken to a plate or cutting board to rest. Put the skillet back into the oven to crisp up the potatoes while the chicken rests, about 5 minutes. Remove the potatoes, break down that chicken, and eat like you mean it!